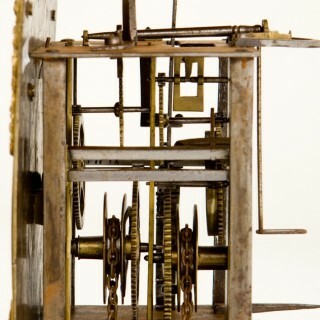 The iron birdcage movement has an anchor escapement and strikes the hours on a bell via an outside countwheel, it retains all its original wheel and metal work. The 10” dial has brass corner spandrels, a silvered chapter ring with trident ½ hour markers, and retains its original hand. William Ball was probably born late 17th century. He worked in Bicester from 1705- 40. 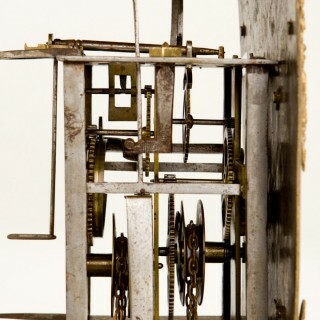 He was recoded making longcase and other clocks. 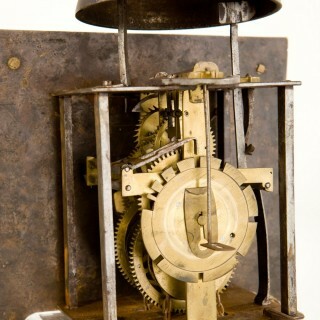 For more info see “Clockmaking in Oxfordshire by Beeson”. 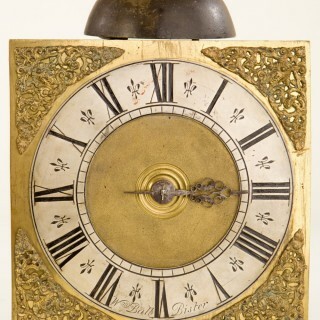 A good rare hook & spike 30-hour wall clock by “William Ball, Bister” (Oxon) C1725.